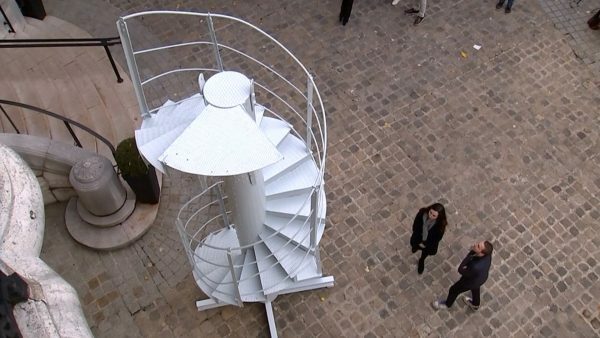 PARIS—A piece of the original spiral staircase from the Eiffel Tower, Paris’s most famous attraction, was sold for $190,885 (169,000 euros) on Nov. 27, a spokesman for auction house Artcurial said, three times the initial estimate. The successful bidder, an unidentified collector from the Middle East, acquired a section of the 129-year-old iron landmark that measures 14 feet (4.3 meters) in height, weighs about 1,984 pounds (900 kilos) and includes about 25 steps. The piece, which came from a private collection in Canada, had connected the top two floors of the Eiffel Tower. It is one of 24 sections that were cut out in 1983 following the installation of a lift between the two floors. Other sections of the staircase can be found in sites such as the Yoishii Foundation gardens in Japan, near the Statue of Liberty in New York and in Disneyland in California. The piece sold on Tuesday had been on public display for 20 days in the courtyard of the auction house on the Champs-Elysees. Tuesday’s bidding was less frenetic than in 2016, when another portion of the Eiffel Tower went for 523,800 euros, exceeding its estimate tenfold.